The march route hit some symbolic targets, including Queen and Spadina (where the controversial “kettling” occurred on the Sunday of the Summit, and around where the vandals first struck one day earlier), and ending at the Metro Convention Centre (where all the G20 handshakes happened). Everyone was well-behaved. During the rally, a few mounted police were letting curious teens pet their horses, while a dozen officers rested in the shade. The list of organizations supporting an inquiry has grown from the Canadian Civil Liberties Association (CCLA) to include Amnesty International, the Canadian Federation of Students, the Canadian Labour Congress, the Council of Canadians, Greenpeace, CUPE, and at least a dozen other groups. The CCLA and Amnesty have started a (somewhat technologically stunted) e-petition to support an inquiry. Solidarity protests have sprung up in other cities, including Halifax, Montreal, and Vancouver. 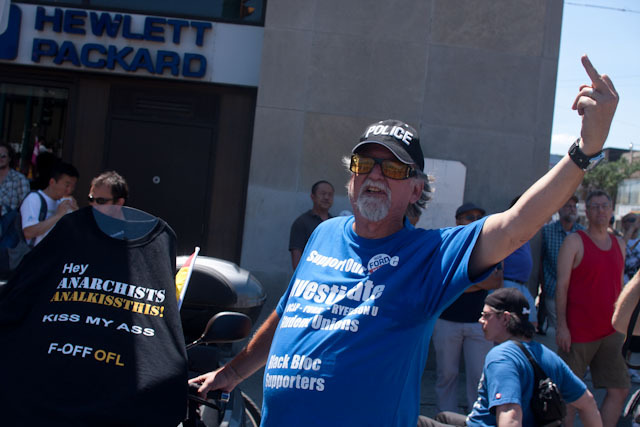 According to organizer Joel Duff, it has been hard for these politically charged organizations to eke out a common path, but they have engaged in some “tough discussions” over the past two weeks to make the movement work. This coalition-style leadership seems to have made the message more diplomatic and less concerned with blame and the grinding of old political axes. The movement now has to penetrate two arenas in order to stay relevant: politics and public opinion. Politically, some movement has already happened through the Ontario ombudsman’s probe into the fake five-metre rule and the Toronto Police Service’s independent review of policing during the summit. 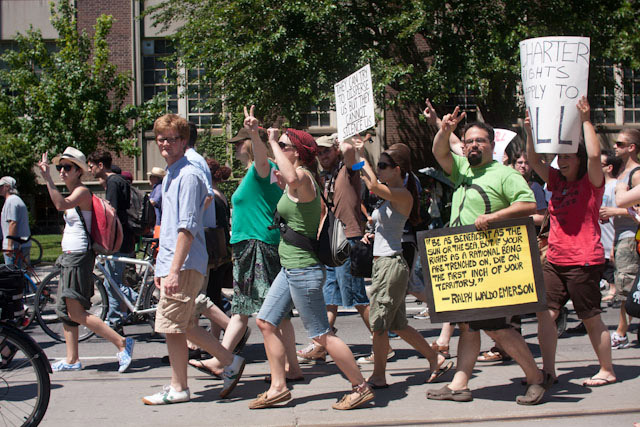 Protesters march along College (top) and are met with an anti-protest protester at College and Spadina, “Rob Ford For Mayor” button and all (bottom). Photos by Nick Kozak/Torontoist. While the the details are scant, organizer Walied Khogali claims support is building in the provincial Liberal caucus for a more in-depth inquiry. He also suggested that the federal Liberal, Bloc Quebecois, and NDP have shown interest in creating a federal investigative committee. To ward off protest fatigue, the movement also has to connect with those outside its circle for support—it won’t remain legitimate for long if it fades into fringe status. It currently relies on a mixed bag of dedicated supporters, including those affected by the summit, civil liberties activists, and anti-G20 diehards. The general public will have to shed its stereotypes and adopt its own degree of dissatisfaction with G20 security measures in order to provide a broader political base. To develop this support, Duff plans to set out around Toronto to “talk to regular people” about the meaning and importance of a public inquiry. The events of the G20 weekend have already roused the political beast in those who would otherwise be uninvolved. As Duff said, “These people out here are not all the usual suspects.” The G20 politicized the city in new ways, and Saturday’s demonstrators are not going to let their questions go away.